Simply put, virtualization is the process of creating a virtual instance of a technology resource like storage, memory, or an operating system; instead of deploying the actual resource. Essentially, virtualization software can convert a single computer into multiple ones. Virtualization has two dimensions: interaction between a virtualized operating system and the underlying hardware and interaction between a virtual host and physical host. Virtualization software operates the same way as any other software application. Once the virtualization software has been loaded, an operating system can be installed from an .iso file or installation disc. The installed OS now runs on a virtual environment referred to as the virtual machine. The main OS becomes the ‘host’ while any other additional OS becomes the ‘guest’. Additional OS that is installed acts like an entirely new machine. Virtualization programs that manage the creation and operating of virtual machines are referred to as hypervisors. Some virtualization products may also use the CPU technology virtualization extensions to increase the performance of VMs. This is referred to as hardware-assisted virtualization. The main advantage of virtualization is the reduced cost, since there is less hardware to be deployed. Others include: centralized management of several resources on one machine and flexibility in the creation of a hardware-agnostic computing environment. Ganeti is a cluster server management tool developed by Google; it is built on existing virtualization technologies like KVM, Xen and other Open Source software. Ganeti was initially started as a VMware alternative for managing networks, storage, and virtual machines- and not as a cloud platform, meaning it lacks several of the features that come with larger open cloud projects. It was designed to handle cluster management of virtual servers and offer quick and easy recovery after physical failures using commodity software. For Ganeti to work, virtualization software must be pre-installed on the servers. Once installed, it assumes management of the virtual instances; Ganeti handles startup, shutdown, OS installation, migration, disk creation, and can be used to preemptively relocate a VM off a physical machine that is failing. Ganeti can be used for both single-host management, like Xen Tools or Libyirt, and large-scale computing on an OpenStack level. 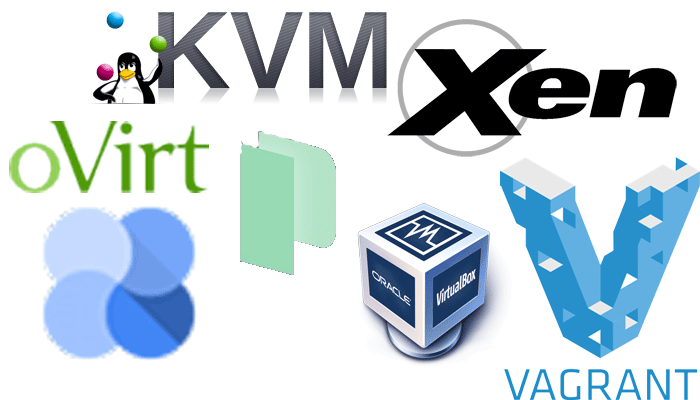 KVM is an open source virtualization tool for Linux and contains virtualization extensions (AMD-V or Intel VT). It can either be operated in emulation or hardware mode; however, without the CPU extensions, the overall performance will be poor. Despite the fact that it was designed for command line, KVM has a decent management interface that enable users to perform actions like launching and stopping virtual machines or taking screen shots with ease. The interface (Virtual Machine Manger – VMM) can also be used to control Xen virtual machines. Each of virtual machine within KVM has personalized virtualized hardware: a graphics adapter, disk, network adapter, etc. If you are searching for a free modern virtualization solution with an unlimited usage mode and without additional feature tearing or licensing fees, and a powerful command line interface then KVM is your best bet. oVirt is a virtualization solution used to manage/create virtual datacenters. oVirt manages storage options, virtualized networks, and virtual machines using interactive an easy to use web-based administration and user portal. oVirt supports several advanced virtualization features like live storage migration, high availability, and the ability to control and schedule the deployment of virtual machines. Aside from the oVirt engine, this Red Hat backed project also includes other components, like oVirt Node – a scaled down version of Linux with enough code to host virtual machines. The oVirt project also includes data reporting and warehouse components, based on the work of open source software providers Jaspersoft and Talend. Packer can be used by system admins to build then subsequently manage the operations of virtual machine images. The same commands and files can be used to build an image on Digital Ocean, AWS or for vagrant and VirtualBox. This enables you to use the same system for development which you then create in production. Packer is notably light, high performing, and operates on every major operating system. It assembles and configures all the necessary components for a virtual machine then creates images that run on multiple platforms. Packer doesn’t replace configuration management tools like Puppet or Chef; as a matter of fact, when creating images, Packer can utilize tools like Puppet or Chef to install applications onto the image. Vagrant is a command-line tool that provides a framework and configuration format for creating, managing and distributing virtualized development environments. These environments can live on your computer or in the cloud, and are portable between Linux, Mac OS X, and Windows. Vagrant has a differentiating feature – Vagrant Share that enables users to share their running Vagrant environment via the internet. This makes it easy to collaborate and share on development environments thus creating consistent working environments for teams of software developers using a virtual machine. Vagrant can also work alongside configuration management tools like Puppet and Chef. VirtualBox is an open source cross-platform product that is currently under the stewardship of Oracle. VirtualBox is one of the veterans of the virtualization scene, and remains a lightweight and reliable virtualization tool that is easy to install and use. With its latest release, VirtualBox adds support for touchscreens and other user-recognizable improvements like Webcam pass-thru, support for IPv6 with VRDP and, video capture support. One important feature VirtualBox lacks is the ability to boot from existing Boot Camp partitions. Xen is a hypervisor that started out as a Microsoft backed startup at the University of Cambridge and has now risen to become one of the best Linux hypervisors. The Xen Hypervisor is inserted between the server’s hardware and the operating system. This creates an abstraction layer that allows multiple guest operating systems to be concurrently executed on a single physical server. Xen is included with most popular Linux distributions like Fedora, RHEL, CentOS, Ubuntu, and Debian. Xen supports ‘hardware assisted’ virtualization and para-virtualization for unmodified and modified guests respectively. The guests can be windows or Linux, but most guests particularly in the hosting space are Linux variants.